When you crave for a refined outdoor life, you can complement your patio and garden with a matching wooden deck design. 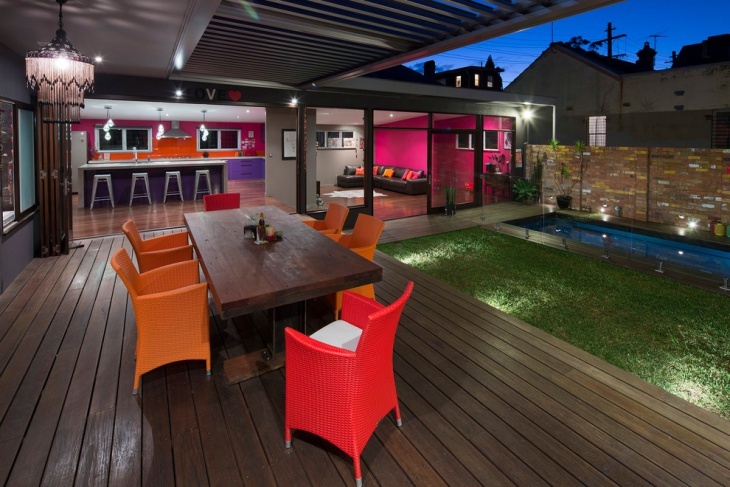 A sophisticated look in the outdoor areas is desired by all. With the right choice of furniture and other accessories, people have come across different innovative deck designs. Wood itself is inherent with impressive decorative features, and when you get the right things into place, you gain something attractive. 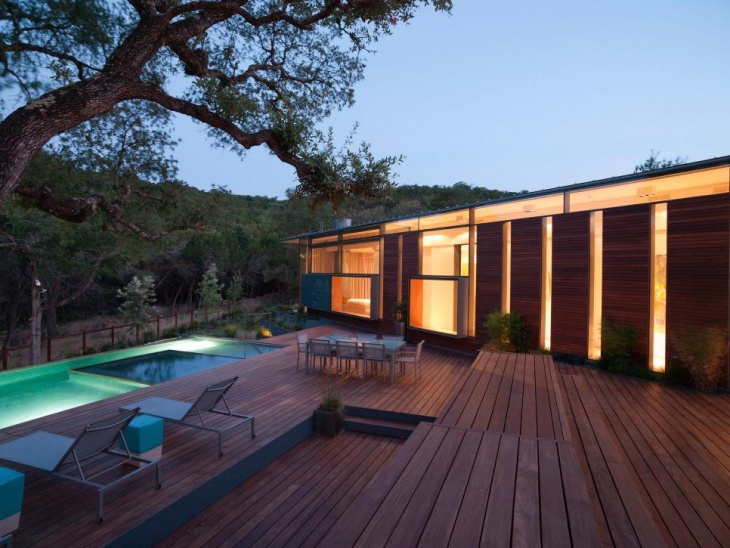 Here are ten awesome wooden deck designs which you will love to admire. 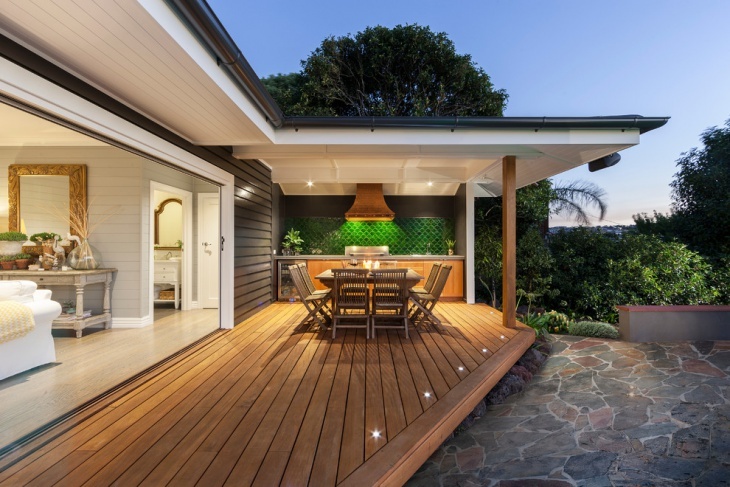 Wooden outdoor decks can be built either in the terrace or in the garden. In either areas, it fits the limited space superbly. 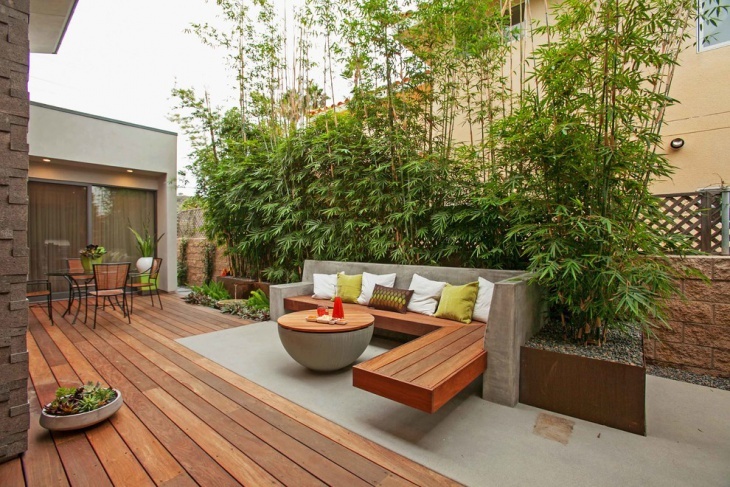 With wooden trellis and tall planters in the deck, the space looks splendid. 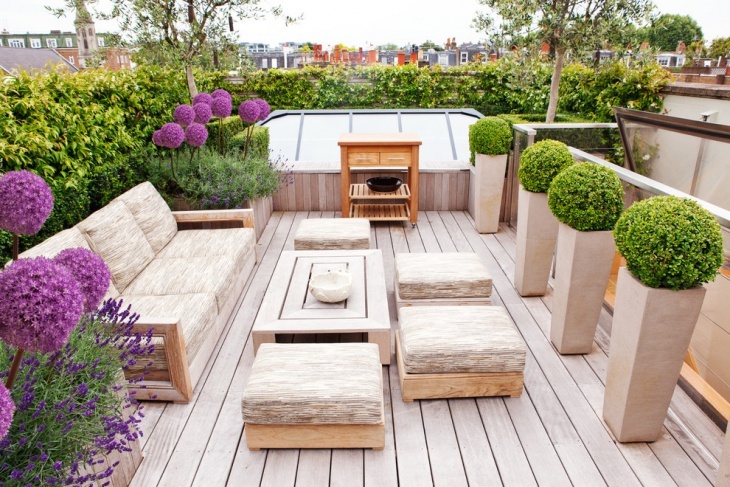 The beige and purple colour combination for the deck and flowers is innovative, and you can arrange for the necessary sitting arrangement in the wooden deck. When you have an outdoor sitting areas with a stone table-top and river rock ground, you can go for the double deck idea. This is an ideal setting for a rock patio, and you can implement other beautifying accessories like a fountain in the space to make it look beautiful. Houses in higher grounds have a sloping yard or terrace garden. 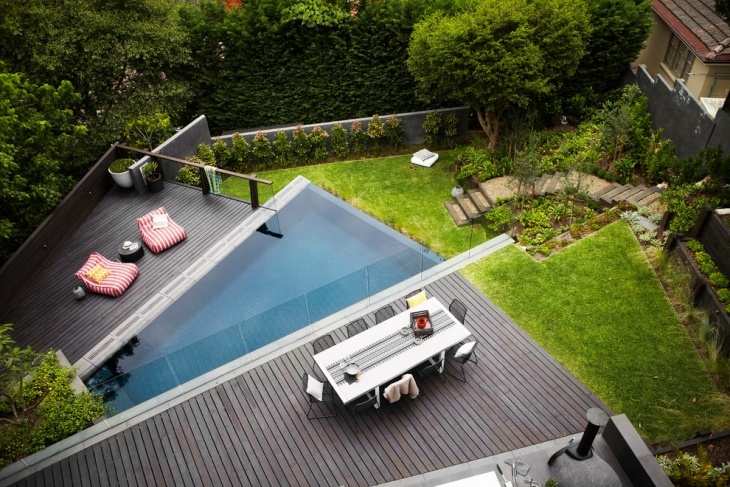 In these areas, you need a fashionable deck to complement the beauty. 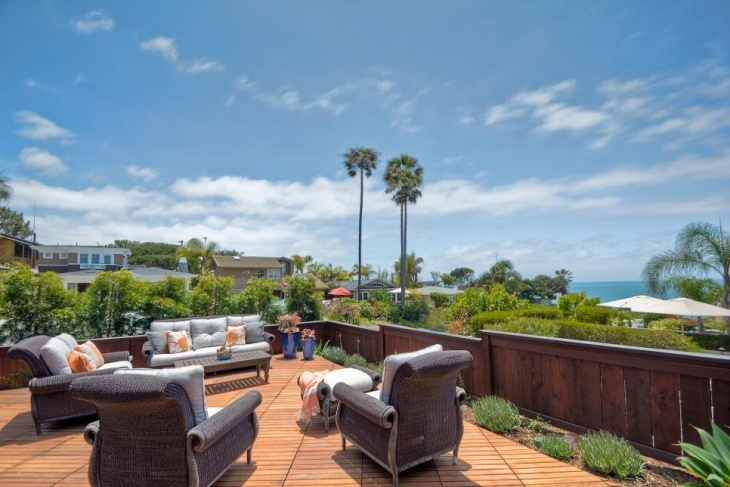 This widen structure has multiple decks, and kooks great amid the green cover in the step garden. If you are looking for a beautiful outdoor deck for your backyard patio, get in touch with this particular design. 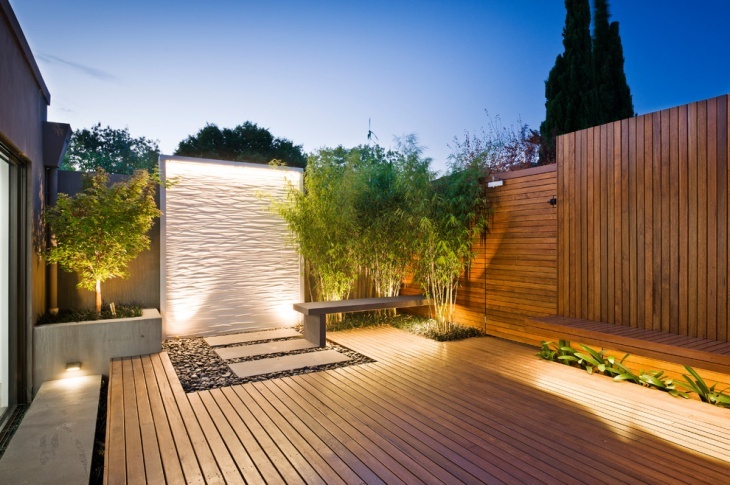 The elevated area can be made further sophisticated when you use tiny deck lights along the borders. 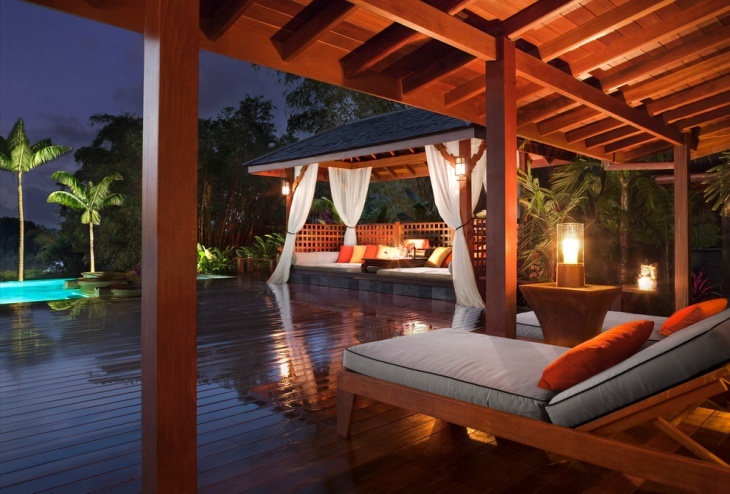 The covered wooden deck has a bright appearance and you need to get matching wooden furniture to be placed under the covered area. 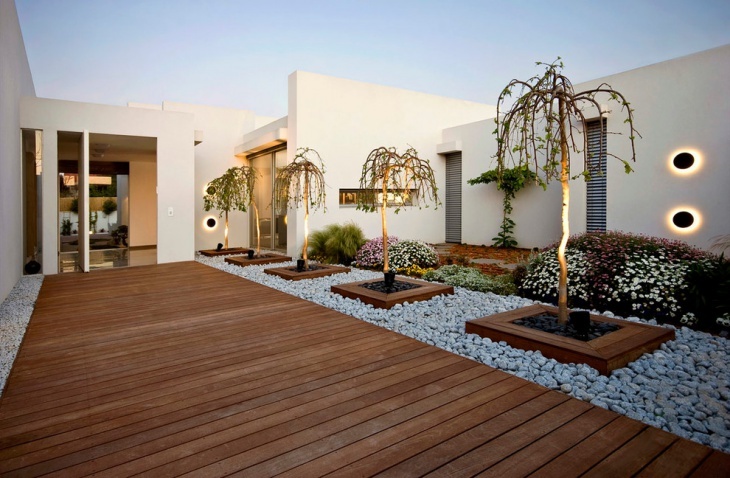 A sleek and smart wooden deck can cater the purpose of a boardwalk when you think of your front yard. Line both the sides of the deck with small river stones and incorporate island flower beds for decorative wood planters. Innovative wall lighting will add to the splendour of the front yard. 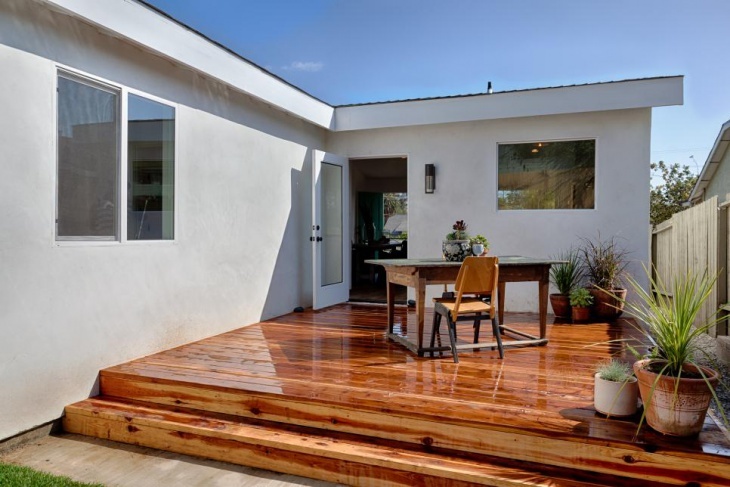 Houses in hilly areas have wooden decks with railings, and in these cases, you can create a great compatibility between the floors and rails. The wood patio has deck tiles along the steps and enjoys a contrasting look with the grey walls, pillar and furniture. 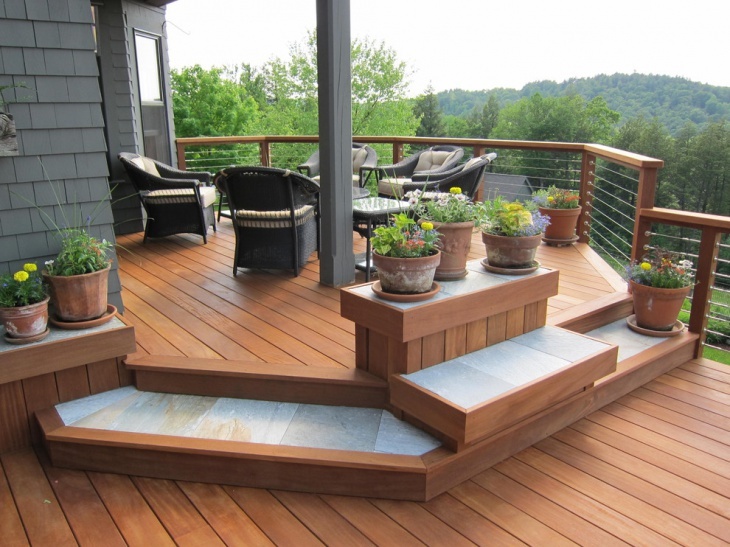 Potted plants in the deck can further enhance the beauty of the patio. 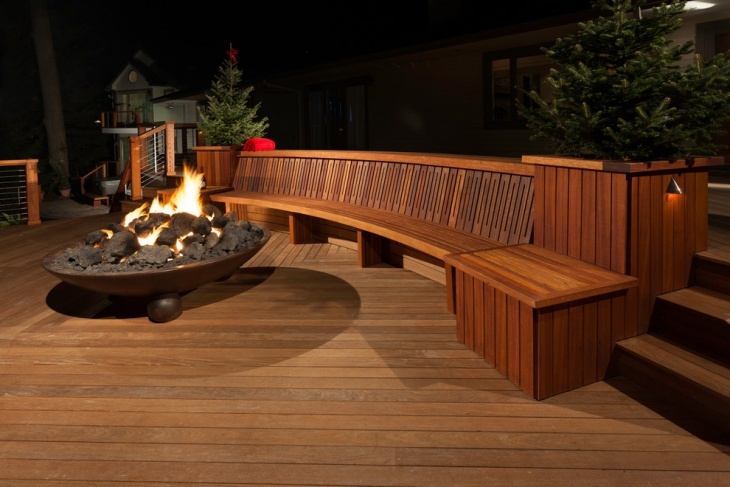 When you look out for a Transitional Deck with an outdoor fireplace, you can arrange for an elegant wood-deck bench in the area. The combination is superb, and the elegant patio area basks in beauty. The in-built deck in the sitting area is ideal for storing necessary accessories. 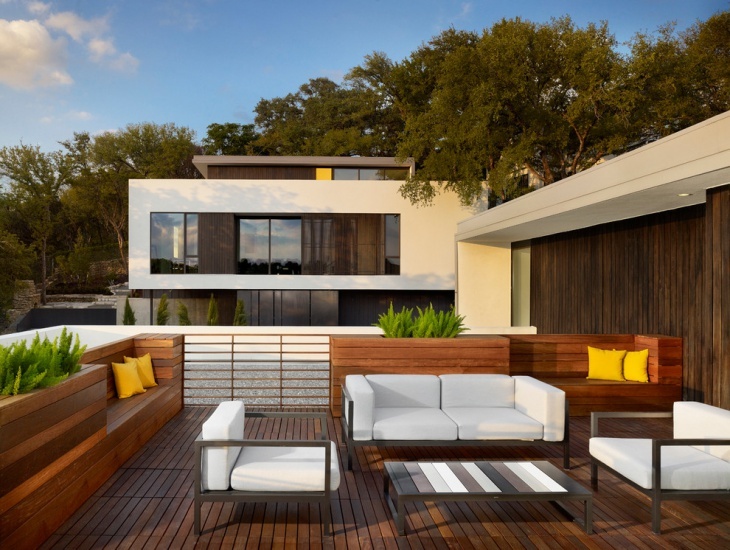 Houses with modern patios look great when you have a smart and sleek deck. You can opt for grey furniture and sofas in the space, and opt for a darker shade of brown for the wood sidings. 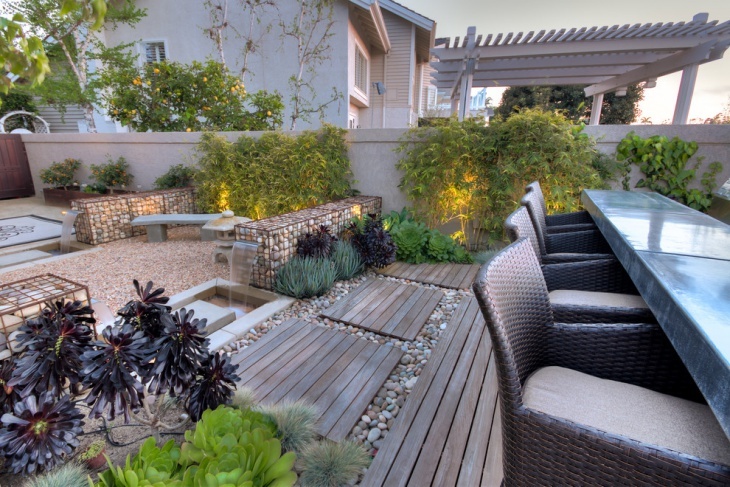 The railing planters are bright and beautiful and the low deck table in the center has a sophisticated look. 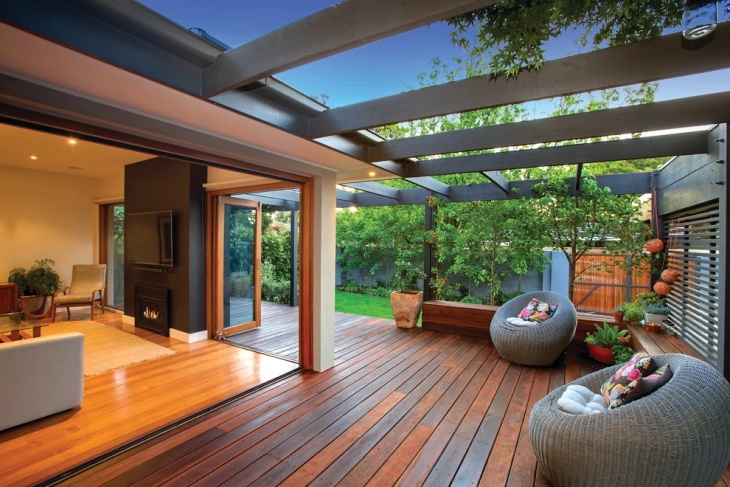 People are trying out diverse wooden deck design ideas in their patios and rooftops. With the inception of new ideas and aptitudes, the designs are evolving. 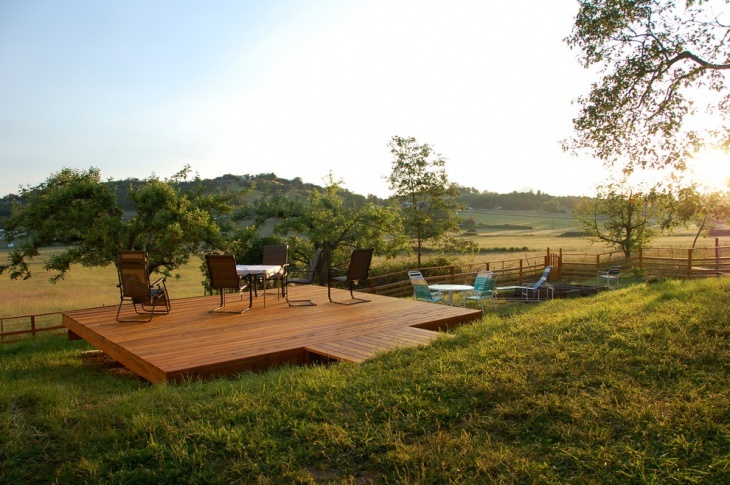 You may come up with your own wooden deck design theme, and when you do so, feel free to share your ideas with us.